OK, fellow dish detectives, I need your help! Especially those of you who ever visited Rich's tea room, the Magnolia Room, in Atlanta. I bought this egg cup recently because it is said to be the pattern that was made for the Rich's tea room. I've shown it to one friend who used to go there, but she doesn't remember what sort of china they used. Do any of you? 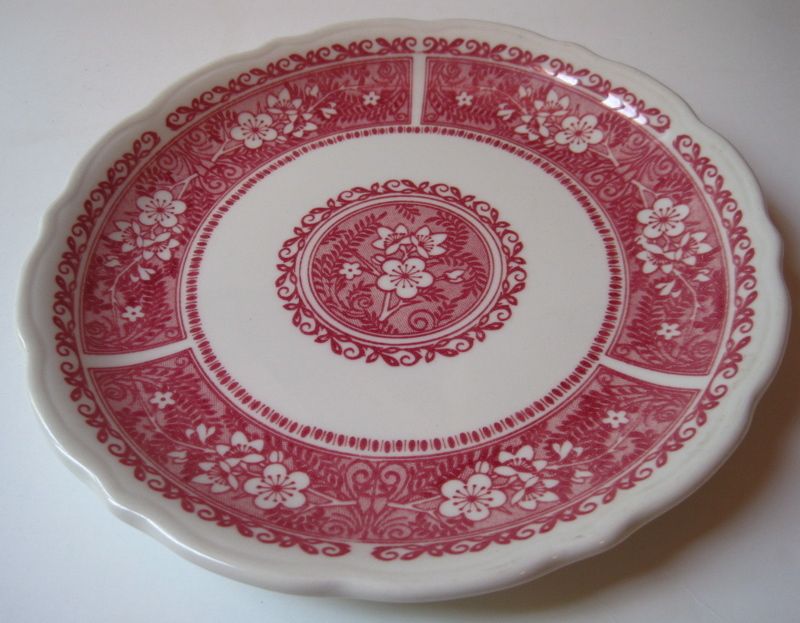 Another piece that I know for sure came from an old department store is this 10-inch wide scalloped dish marked Parco. 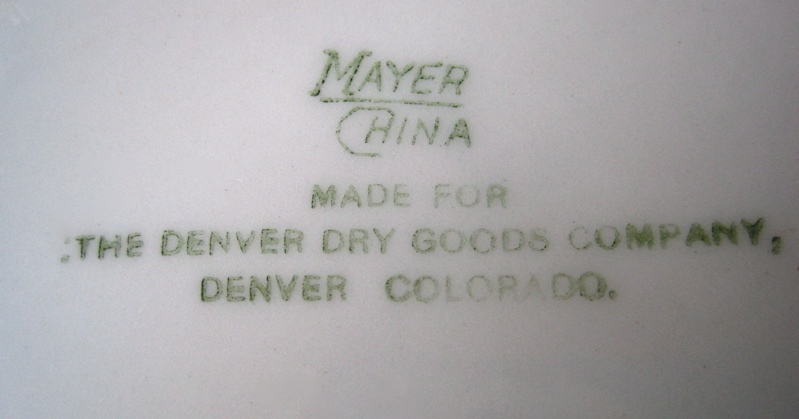 It came from the Denver Dry Goods Co. in Denver, Colorado, and the Parco name? Well, this involves a fun little story. A Denver-based oil company, the Producers and Refiners Corporation, constructed this town in Wyoming between 1923 and 1926 and named it Parco, which stands for "P"roducers "A"nd "R"efiners "CO"rporation. I believe this dish was probably used at The Parco, a hotel in the town, whose name was later changed to Sinclair. With the oil company based in Denver, it's not hard to imagine that the Denver Dry Goods store was sought to acquire some restaurant dishes for workers there in Parco. These are by Mayer China, a name which keeps coming up in my research of old department store dishes. If any other history lover out there knows more about Denver Dry Goods, its famous tea room "The Denver" and/or Parco, please share! They say when you've got three of something you've got a collection, so I guess this third piece of restaurant ware makes me a collector! We've got a great new antique store on the square in Newnan called Grannie Fannie's, and when I was in one day last week I found this dish, which some of you may recognize as the piece I used in Saturday's post about tea sandwiches. I recognized this as restaurant ware because of the thickness, and the pretty Strawberry Hill pattern reminds me of Red Willow, the pattern similar to Blue Willow. Now, I'm curious to learn which restaurant(s?) 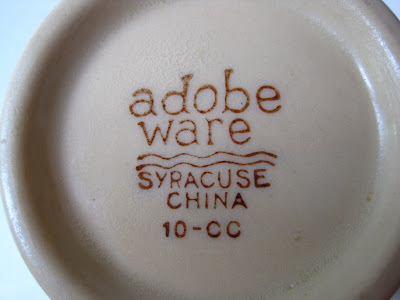 used this particular restaurant ware. 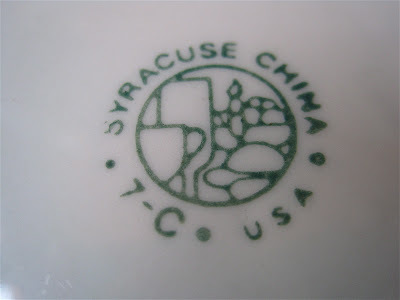 I'm just starting to learn a little about Syracuse since that is also the company that made the egg/custard cup above. 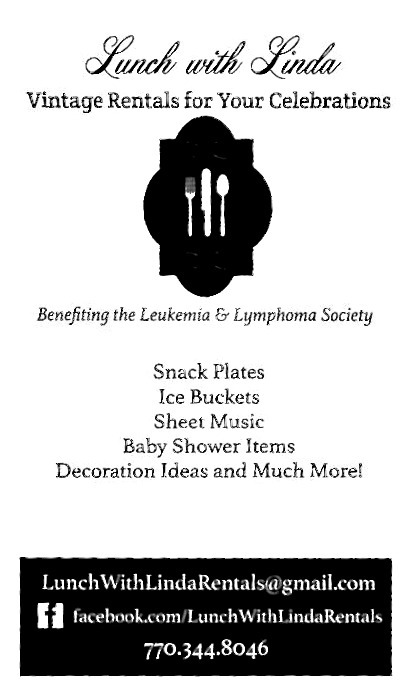 Do any of you collect restaurant ware? 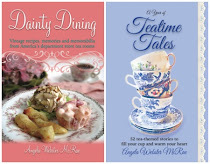 I never thought I would because it's not the pretty English bone china I so love, but since at least some of these pieces have a "tea room legacy," they have led me down yet another collecting and researching path! ... Trish, who writes the wonderful Sweetology 101 blog! If you'll send me your snail mail address via the e-mail button at right, I'll get these teas headed your way! Congrats! Are you going to a Memorial Day observance? Cooking out with friends? 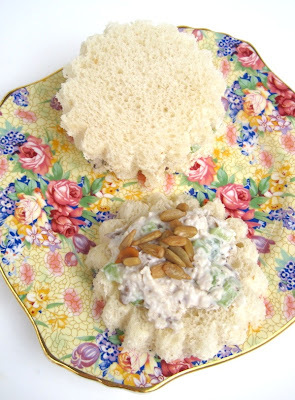 Headed to the lake for a picnic? However you celebrate the day today, I just wanted to wish everyone a safe and Happy Memorial Day! 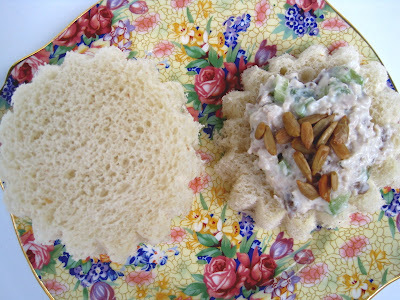 Each week when it's time to choose a tea sandwich recipe, I ask myself, "Self, what are you really in the mood for this week?" 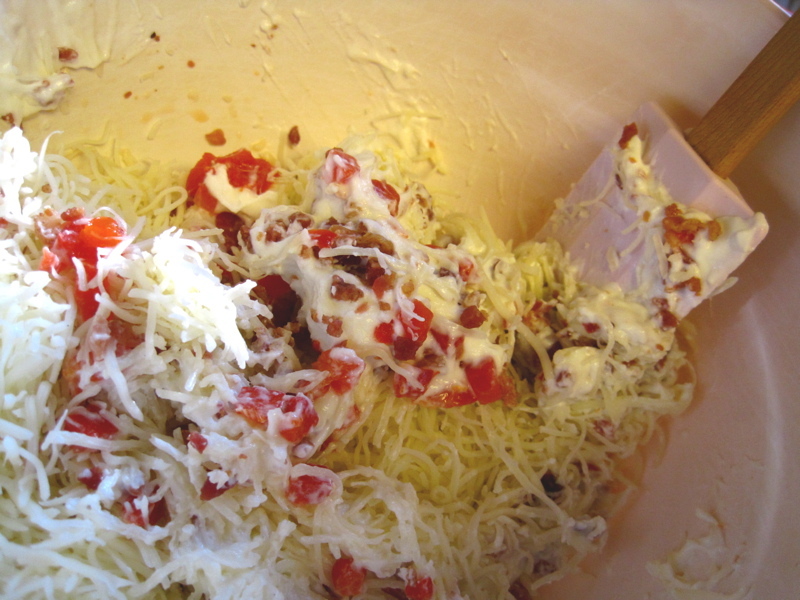 This time I was craving something pimiento cheese-like, but I didn't want to make the same old pimiento cheese. So I began looking online for recipe inspiration, and soon I decided that since others had successfully made sandwich spreads with Swiss cheese, I would experiment with that cheese too! 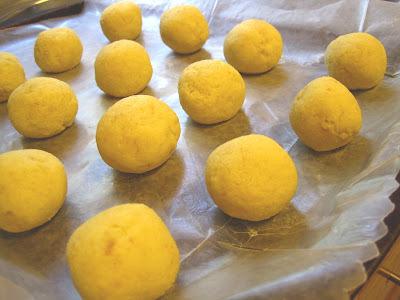 I'm learning that some of my favorite recipes are really the easiest, simplest ones to make. Now why is that? Wouldn't you just naturally think the dishes you slave over would be the most delicious? But no, that's just not so. I really like this new Swiss cheese spread, and perhaps some of you will too. Mix all ingredients and stir just 'til blended well. Yields about 2-1/2 cups of spread. 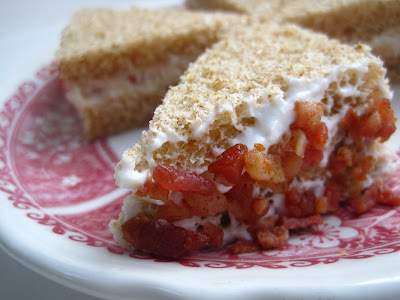 I used mine on plain whole wheat bread and was quite pleased with the combination. 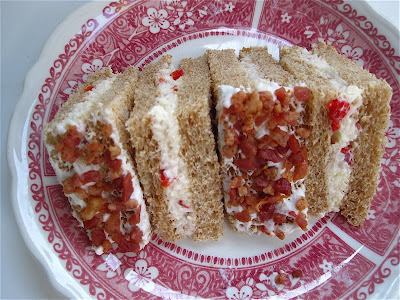 Decorative note: On two of these sandwiches, I lightly dipped the short end of the triangle in the sour cream and then in the bacon bits. 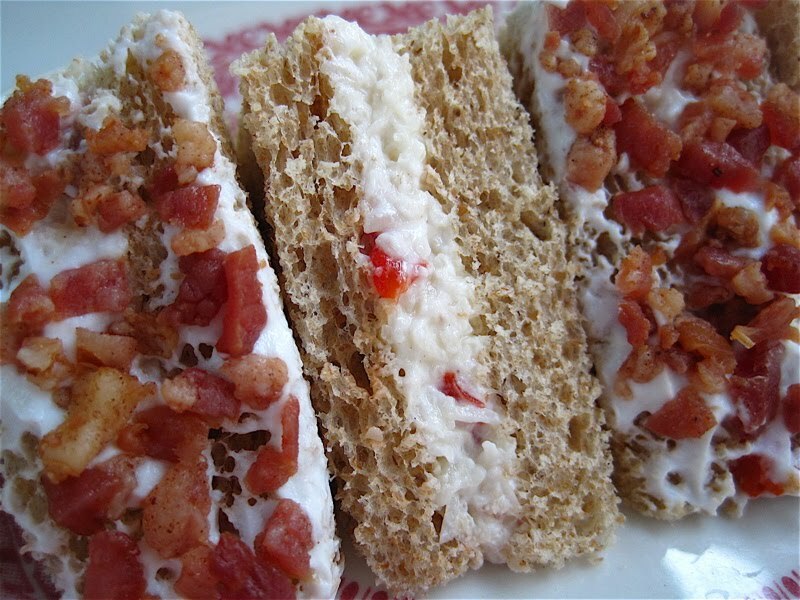 This adds a pretty finishing touch but keeps the sandwich tidy to handle! I've learned it's fun to do giveaways over the weekend so more people can participate, so let's get one going today! 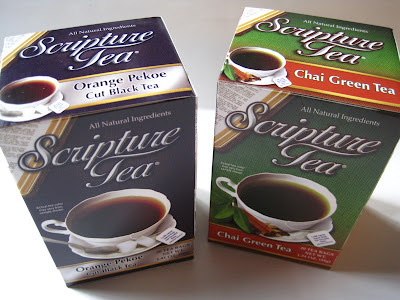 The good folks at Scripture Tea asked if they could send me a few samples of their unique teabags with scripture verses printed on the teabag tags and I said sure. I was surprised (but happy!) 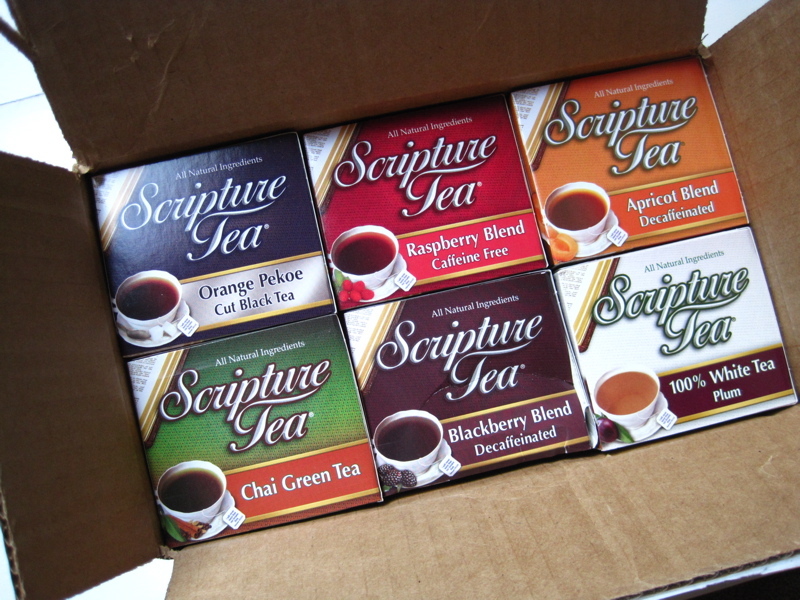 when the package arrived and it was six entire boxes of tea! Now I will need some help drinking all this tea, and I'll bet one of you tea friends might be willing to help. Here's my idea: I will keep half, and one of you will get half. How's that? Since I've already tried (and enjoyed) the black tea and the chai tea before, the winner will automatically get these two boxes. However, I can't decide which one of these other four boxes to give away, so I'm just going to let you decide! You get to choose from, left to right, Apricot Blend, Raspberry Blend, 100% White Tea with Plum, and Blackberry Blend. 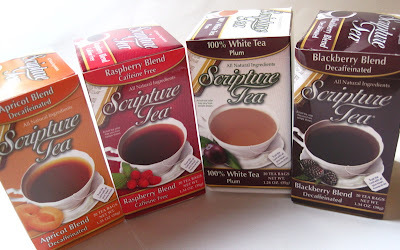 If you'd like to be entered in the giveaway, just tell me which *one* of the four flavors above you want added to your other two, and soon three brand spanking new boxes of tea could be headed your way! Just comment before 7 a.m. EST time Monday, and I'll post the name of the winner later that morning. Good luck! Although I have a few of the pretty Wedgwood blue teapot and teacup Christmas ornaments, I believe the only full-sized pieces of true Wedgwood I own are this teacup and saucer and the matching mug. 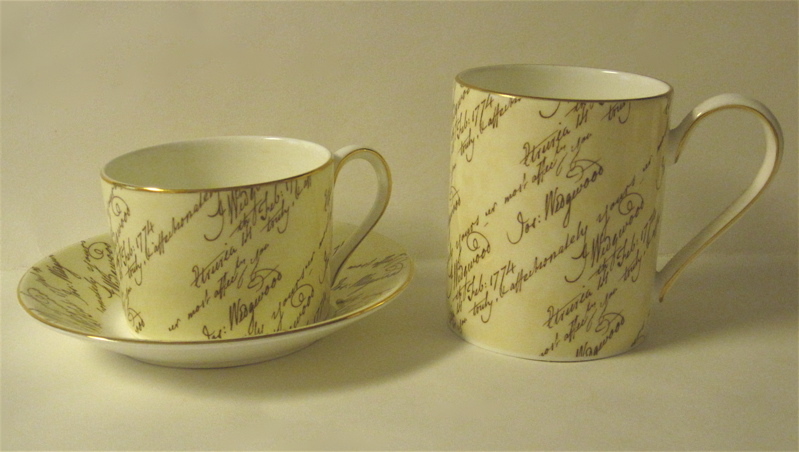 These were part of the Wedgwood Bicentenary Celebration line and are designed with the handwriting of company forebear Josiah Wedgwood. As a writer I especially love things with handwriting as part of the design, but of course as a tea lover I also have great respect for anything bearing the Wedgwood name. Knowing that I love teawares, and I love roses, my friend Deberah ordered me a birthday present that arrived after my birthday this year but I was still quite thrilled to get it. 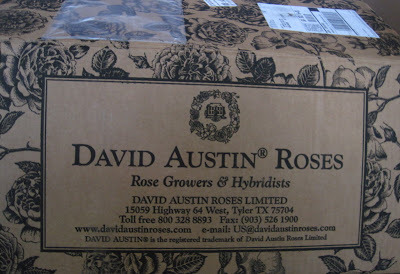 What gardener doesn't love a box from David Austin Roses? 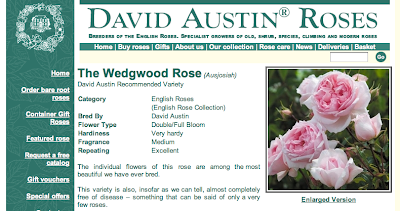 And when the rose is the Wedgwood Rose, oh my goodness! 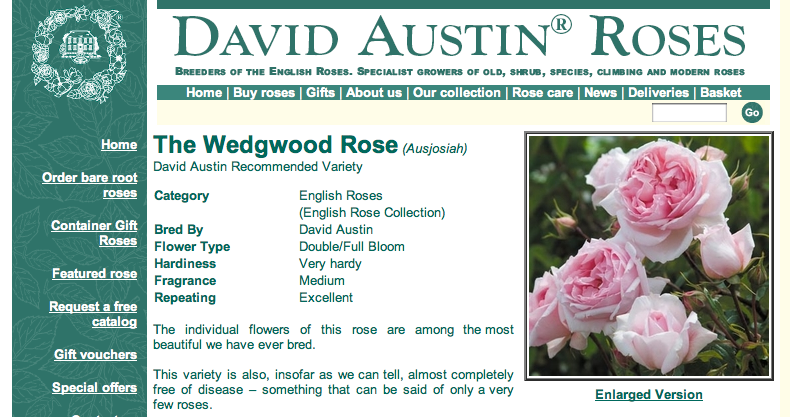 Here is what the rose looks like on the website. 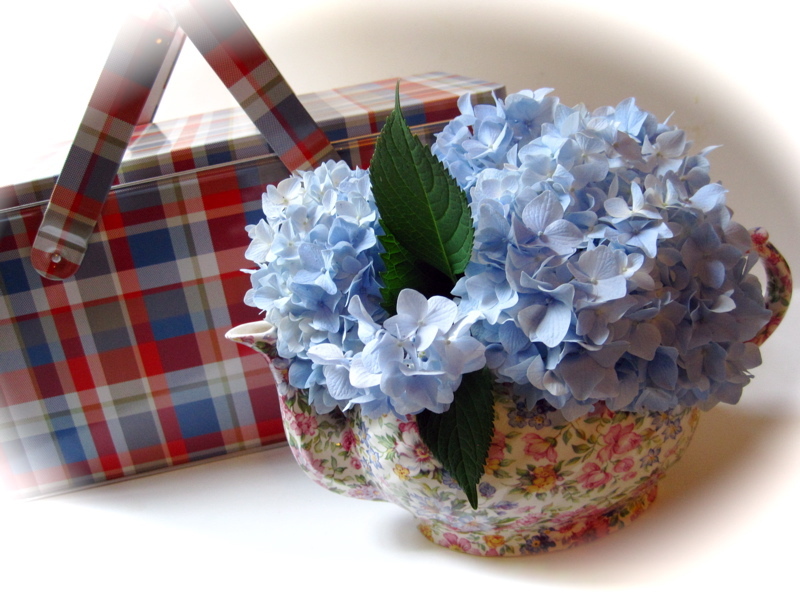 Isn't this a most inspired gift for a tea-loving gardener? 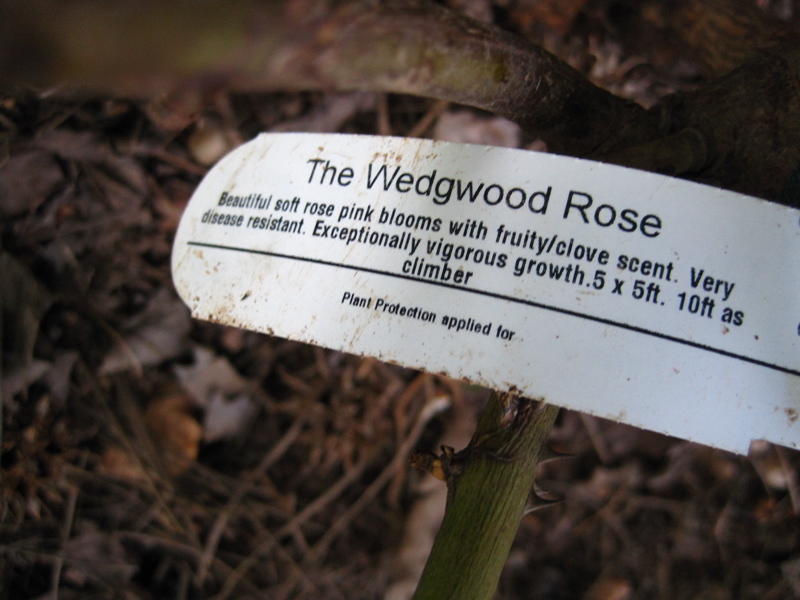 I must say I was impressed at the thoughtfulness behind this gift, and I'm certainly looking forward to the day that beautiful 'Wedgwood' blooms in my garden! 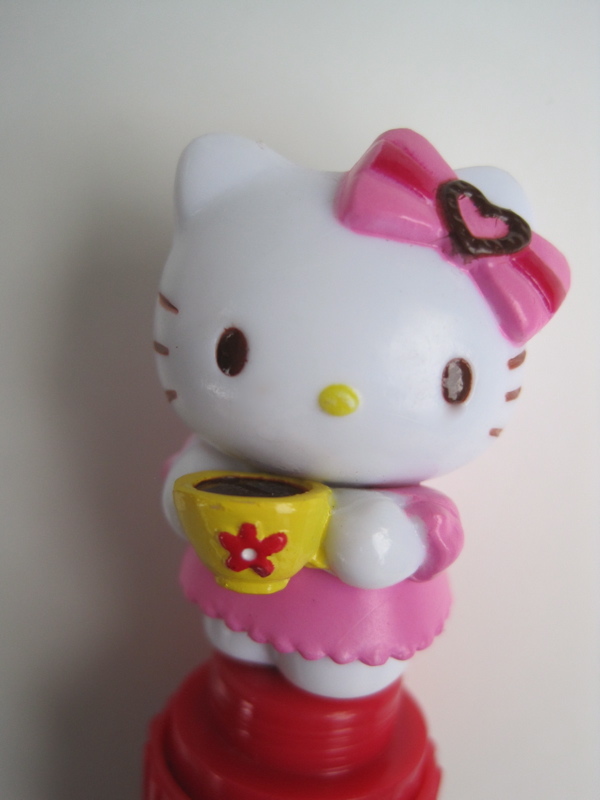 Did you realize that the popular Hello Kitty character has been around since 1974? 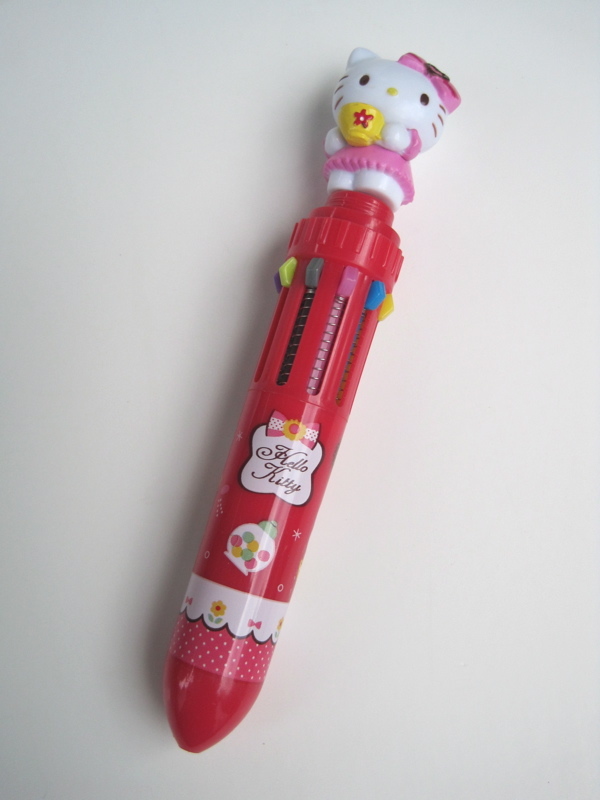 I didn't realize that until I was looking for a little background info on the Japanese company Sanrio's popular kitten character. She can be spotted everywhere from children's stationery and lunch boxes to rather extravagant wedding dresses! 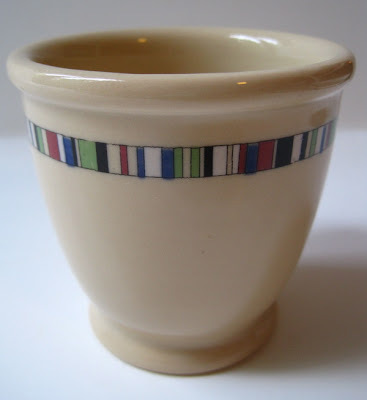 Is this a teacup, perhaps? 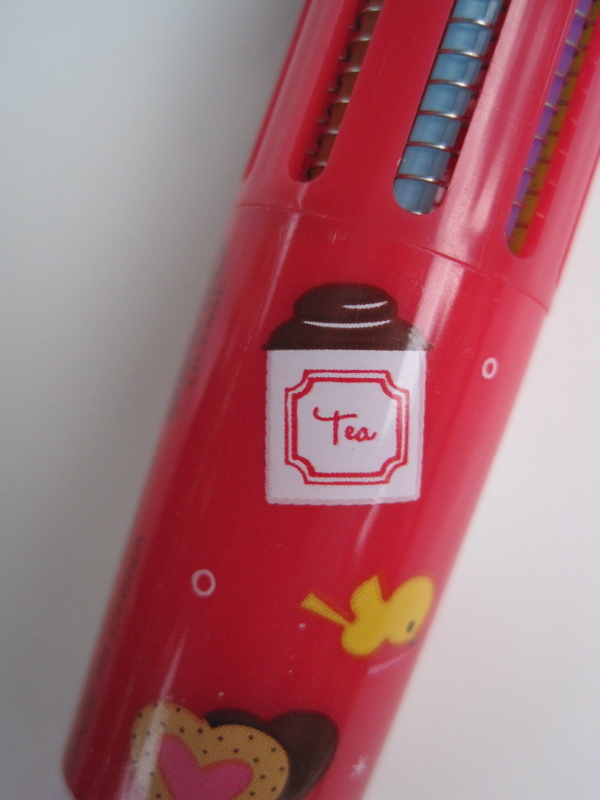 This is definitely a tea tin, confirming that Hello Kitty is a tea lover just as I'd long suspected! 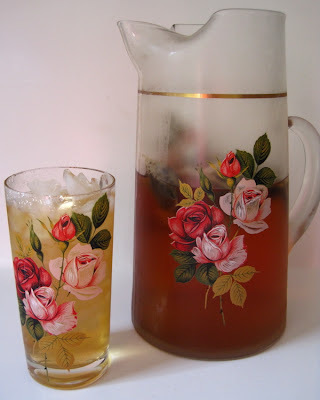 Now that we've had a few days at or in the nineties, I've been drinking lots of pitchers of iced tea. And in a rather thrifty frame of mind, it occurred to me I could use up some of those "Christmas gift teas" I often seem to let go to waste by making iced tea with them. 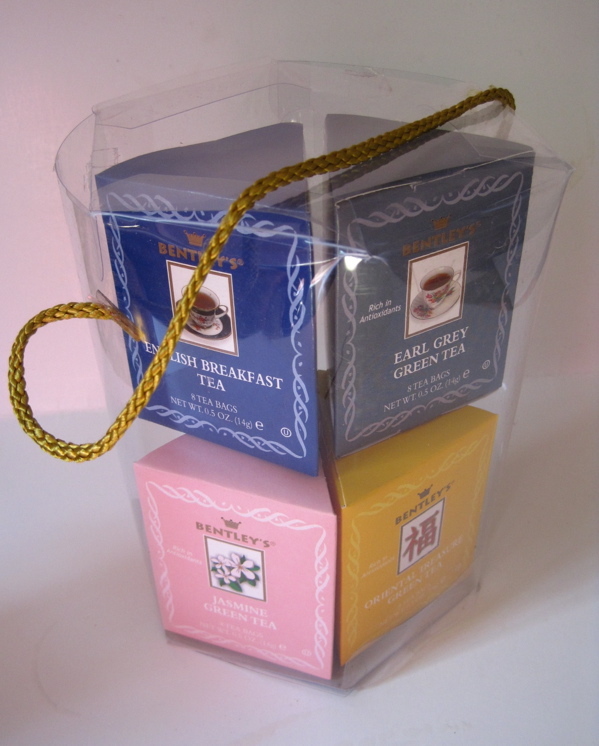 Last year, I received a cute tower of teas, but I sampled just a few of them and put the plastic bin in a cabinet so it wouldn't contribute to kitchen clutter. Naturally, I soon forgot about these teas until I came across them the other day. In addition to being a great way to use up gift teas, I am enjoying trying a greater-than-usual variety of iced teas. I cold-brew mine by placing the contents of one box (eight teabags) in the pitcher of water and then leaving it to steep overnight, and I have found that even the Orange Spice flavor makes a great iced tea! Do any of you ever receive tea gifts like these sets? If so, I highly recommend using some of them to make this season's iced tea! After I paid several dollars for a single Cake Pop at a tea shop the other day, it dawned on me that I had all the supplies to begin learning how to make these fun treats myself! For Christmas last year, my friend Ashly had given me a copy of the book "Cake Pops" by Angie Dudley, also known as "Bakerella" (who blogs at bakerella.com). 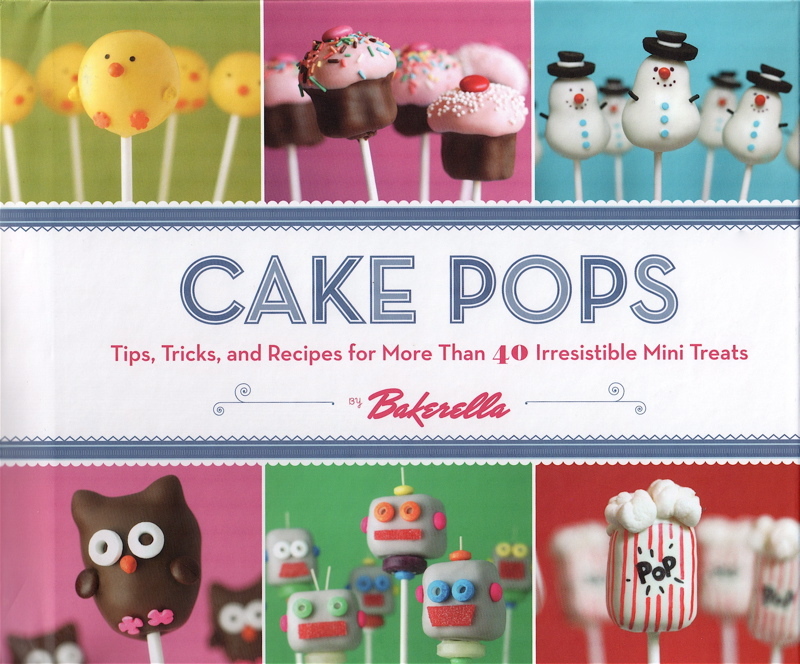 It is a great how-to book, packed with step-by-step photos and instructions and lots of inspiration, too! I first had a Cake Pop about a year ago when a friend told me I should visit a local bakery and try their "Cake on a Stick." It was soooo good, and I loved the fact it was a small treat, not as guilt-inducing as, say, a whole slice of Turtle Cheesecake. Then at Bible study one night, a friend showed up with "Cake Balls," which consisted of a crumbled up cake-mix cake mixed with 3/4 can of frosting, then dipped in icing. So here I have crumbled up my cake and am mixing it with frosting from a can. Super easy! Here are the rolled-up balls of dough about to go in the freezer to firm up before dipping. I used pink candy melts, and after dipping the balls into the candy coating, I placed the newly-made Cake Pops on a Styrofoam base to set. 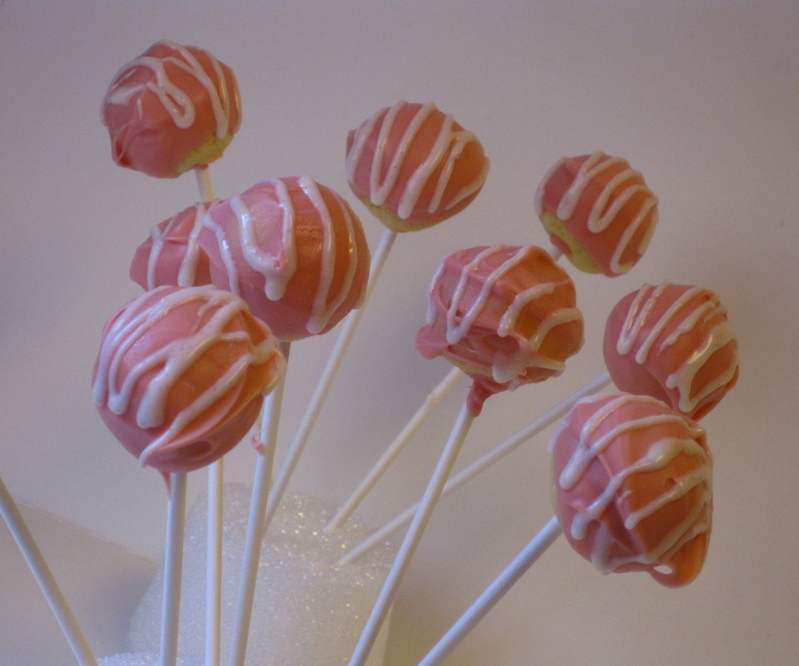 Here is my first ever batch of Cake Pops (so please be kind! 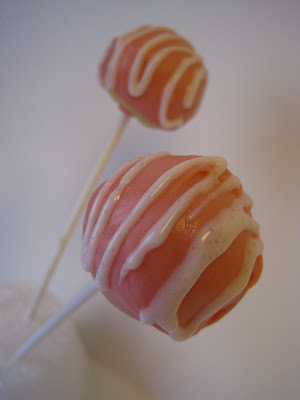 ), drizzled with white icing. 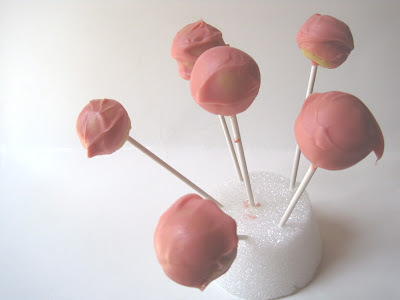 And I didn't really have the proper supplies to do a great job on these, but surely I can practice until I learn to make cute Teapot Cake Pops! 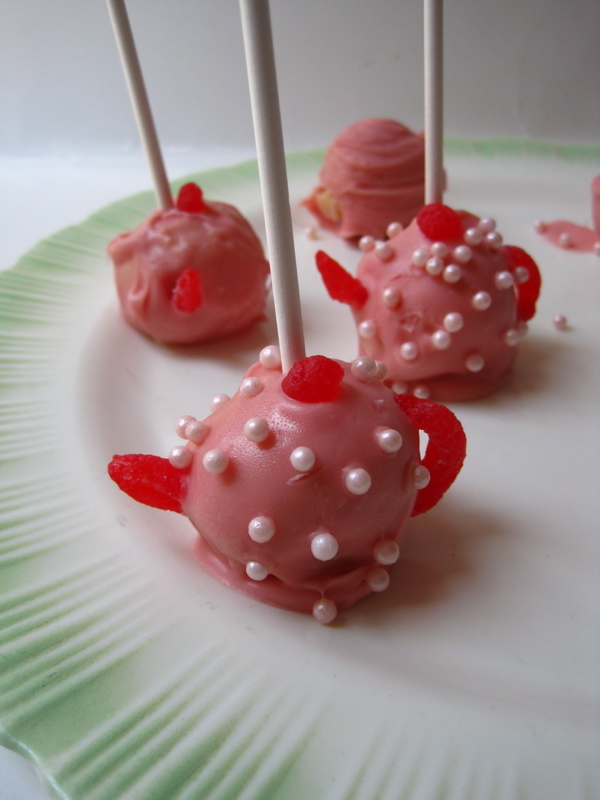 I flattened a red jelly candy and rolled up pieces of it for the handle, spout and knob, but surely there are better options. Licorice? Lifesavers, maybe? I'll be trying these again one day! 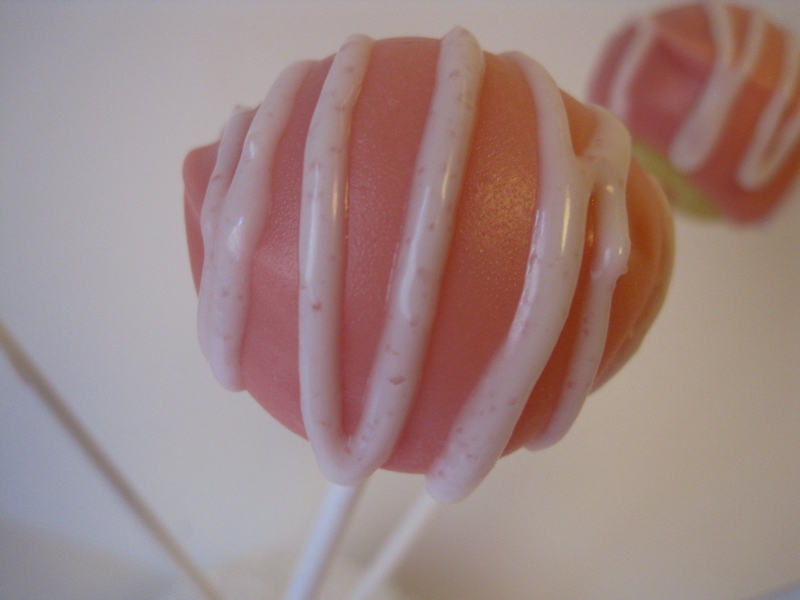 Do you eat or make Cake Pops? If so, please feel free to share your tips! My theory is that you can never have too many chicken salad recipes, and the one I tried this week seems to be recommended by lots of readers on the web. It came from the old Younkers Tea Room in Des Moines, Iowa and is one of the recipes I came across while researching these old department store tea rooms. 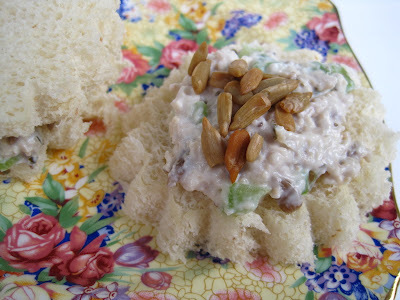 What makes this recipe unique, I think, is its addition of sunflower seeds and Ranch flavored salad dressing, two foods I love and couldn't wait to incorporate into chicken salad! Here's the recipe as I made it. Boil chicken thighs and allow the chicken to rest for about 10 minutes. Tear thighs into large pieces and place in food processor, pulsing until chopped but still containing some chunks of the chicken. 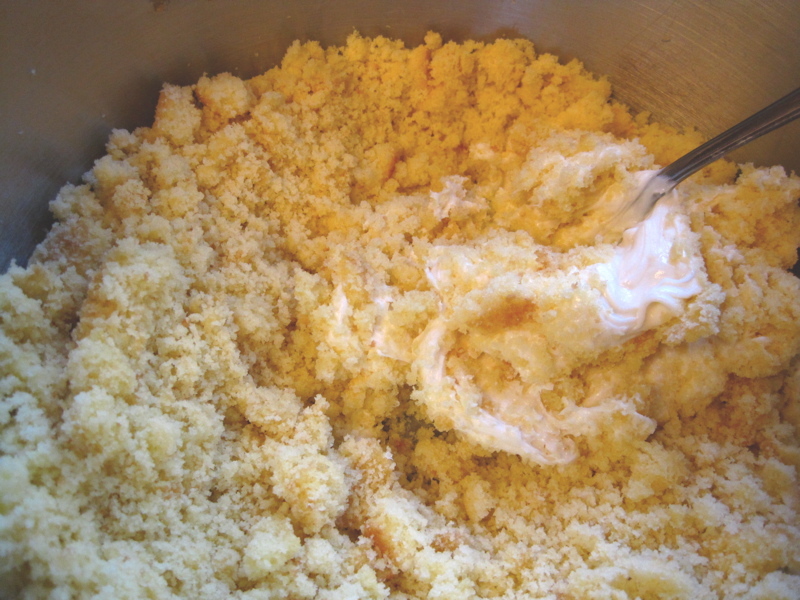 In a large mixing bowl, combine chicken and remaining ingredients. (I started with only 3/4 cup of the Ranch dressing, questioning whether 1 full cup was really needed, but it was!) Toss well and allow flavors to meld overnight. If you eat this immediately it may taste like it needs some salt and pepper, but try to restrain yourself. Leave this overnight and the flavors of the minced garlic and the celery salt really come through the next day. 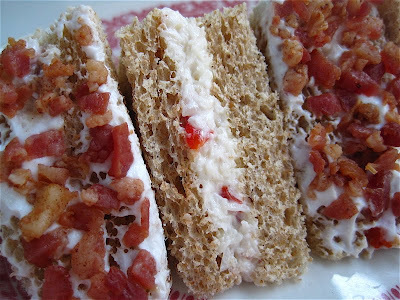 Delicious and crunchy! Makes 6 servings — or a heap of tea sandwiches. 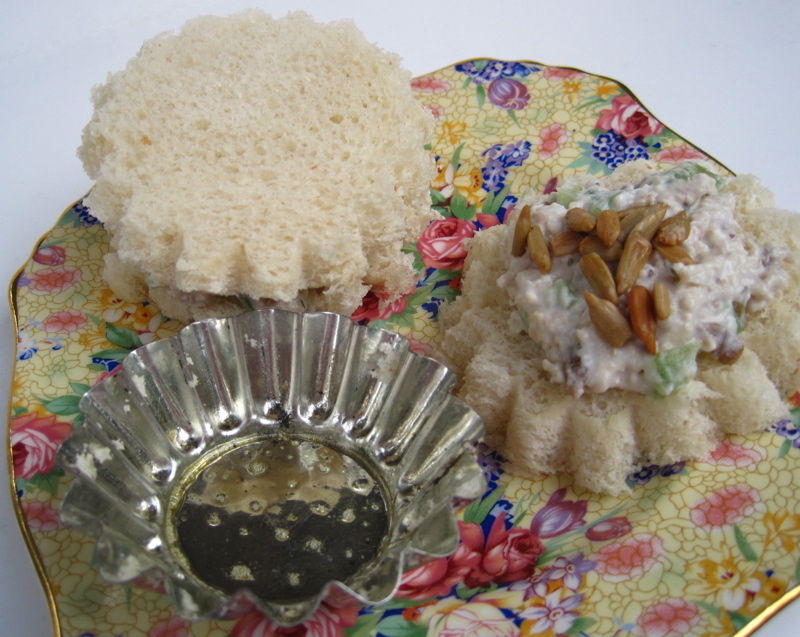 For my tea sandwiches this week, I decided to do something different and used small tart pans to cut out the rounds of (frozen) white bread. If you spray the edges with cooking spray, it will help release the bread and give you pretty and slightly flared rounds of bread. 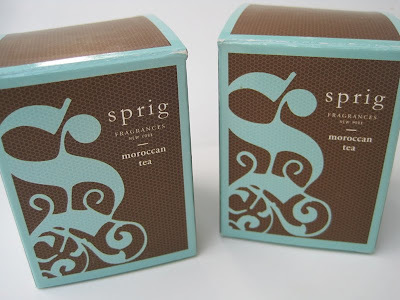 During my shopping trip to Atlanta last week, I stopped by a HomeGoods store in search of a couple of small candles and fell in love with these Sprig Moroccan Tea candles. The packaging is so pretty, and the box says, "Moroccan tea leaves are infused with exotic spices and aromatic notes of spearmint, eucalyptus and sage." 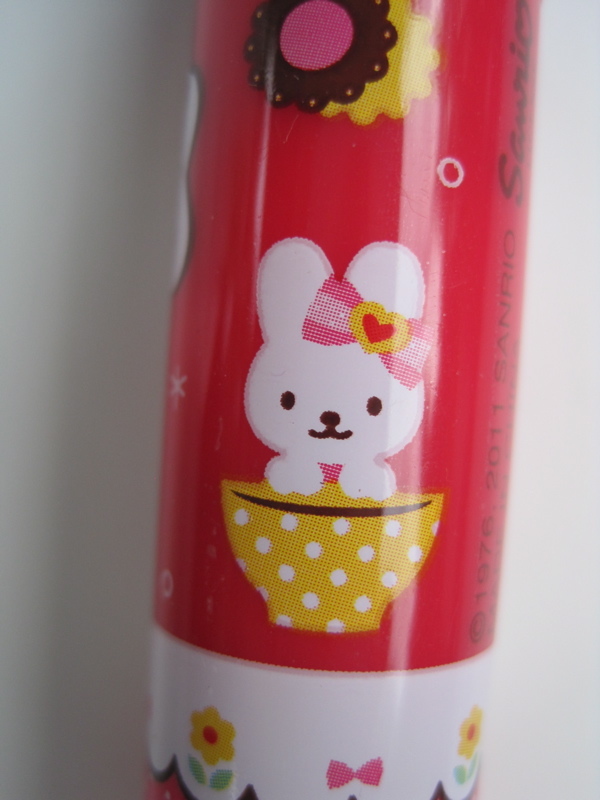 The scent is very light, fresh and rather floral like. 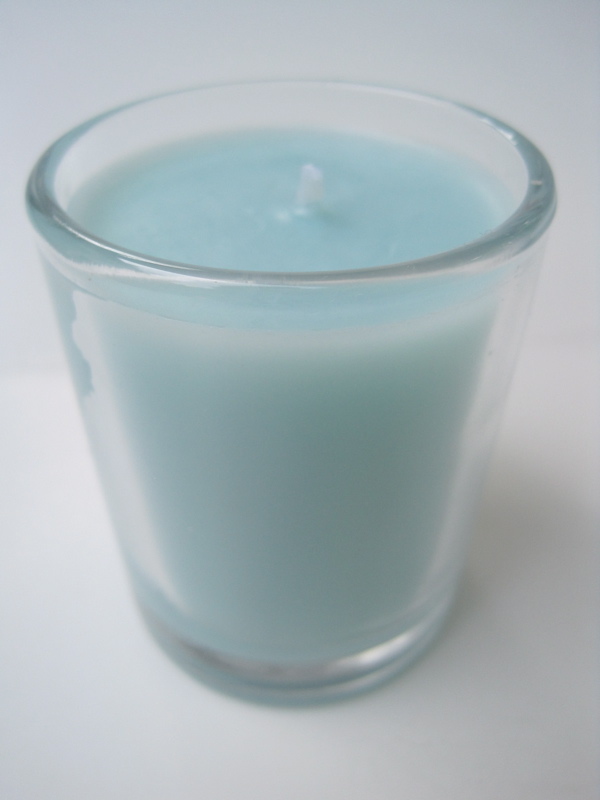 The pretty blue color of the actual candle blends well in my living room too! And you know what I intend to do with the glass votives once these candles are gone? 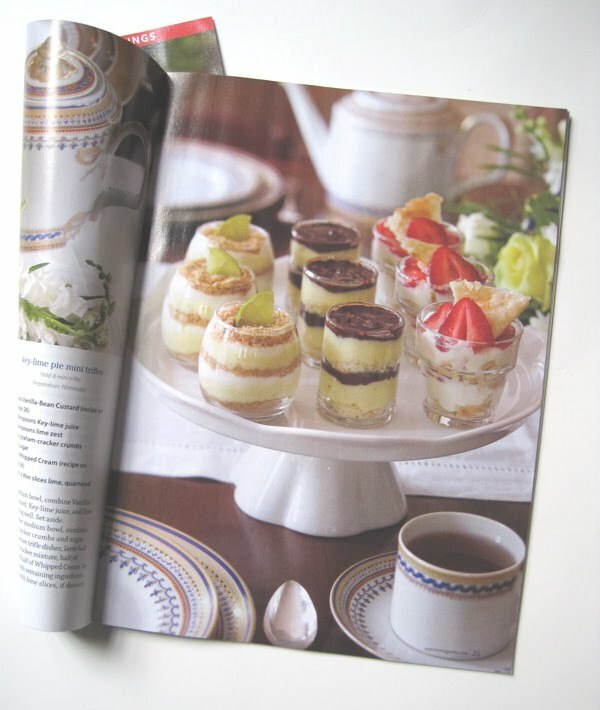 I'm going to save them to use in making those cute mini-trifles featured in the May/June issue of TeaTime! One of the charming things about small towns is that they often have their own distinctive stores and boutiques. Here in Newnan, you might be surprised to hear that a great place to shop for nice gifts is actually a family of locally-owned drug stores, such as the Lee-King Drug Store I visited earlier this week. 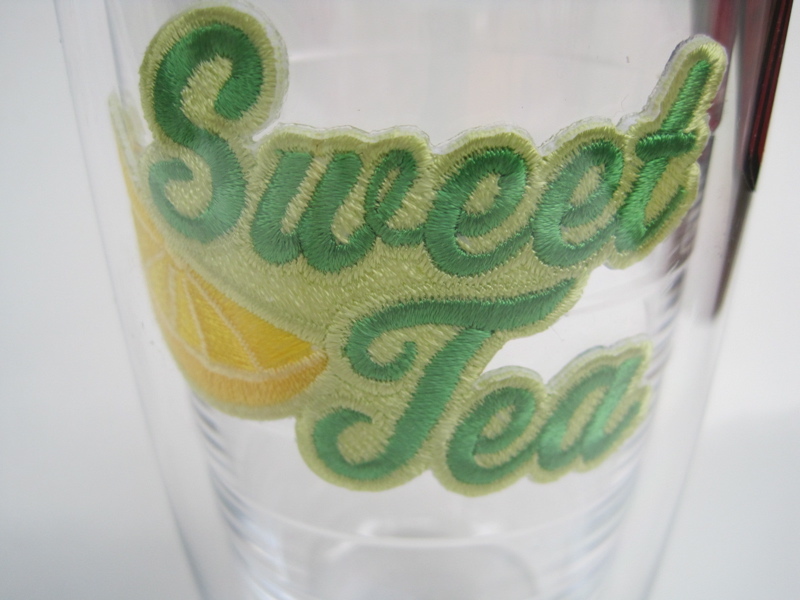 They have great jewelry, gorgeous stationery, some of the prettiest paper party goods in town, and they also stock a terrific selection of Tervis tumblers. Though I'd never purchased one for myself, I have given lots of Tervis tumblers as gifts over the years to family members, usually with a sports team logo on front. Obviously it was a different sort of logo that caught my eye this time! Now my brother-in-law Brad should really be a spokesman for Tervis. He loves these things and requests them for birthdays and Christmas, which certainly makes my shopping life a little easier. Just the other day he was astonished that I still had never used one. They really do keep hot drinks hot and cold drinks cold, he said, and they don't ever leave a ring. You could leave a drink sitting out for two weeks and it would never, ever leave any sign it had been there, he said. He had already convincd me I should try one when I spotted this one at Lee-King. 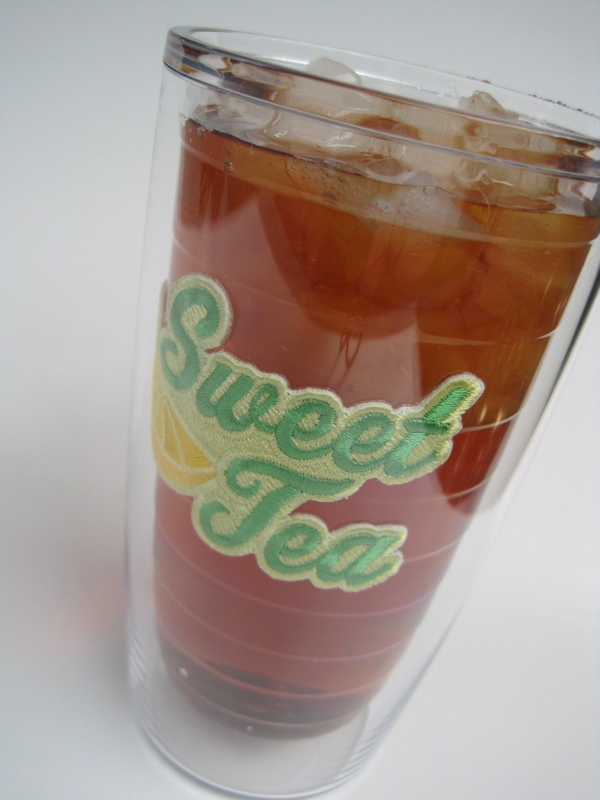 Isn't this Sweet Tea design pretty? 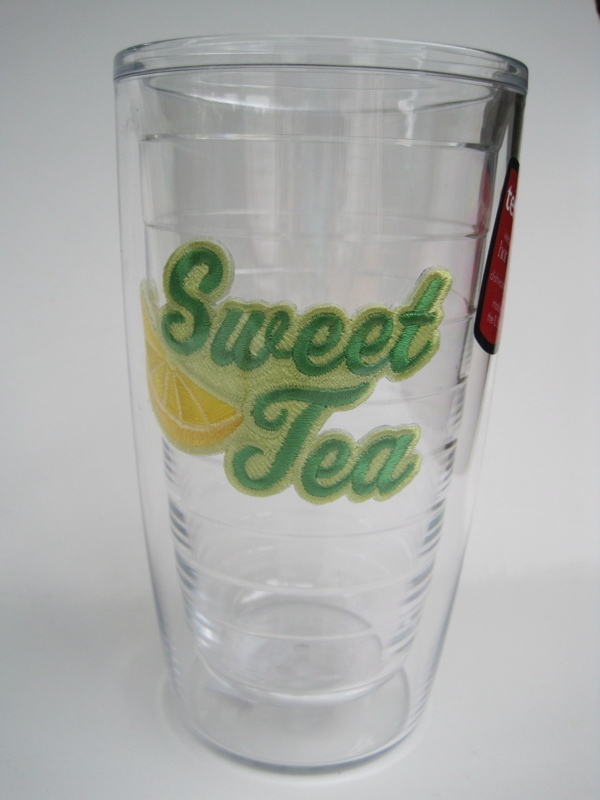 I'm told this is a new design, and I'm happy I now have a Tervis tumbler just for me. And you know what? It keeps hot drinks hot and cold drinks cold. 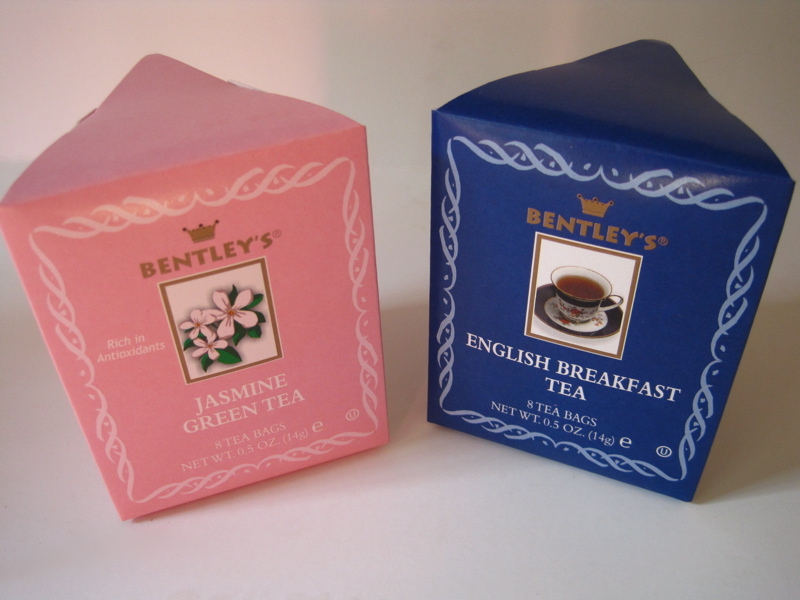 Now if they would just make versions that say Green Tea and Black Tea and Oolong , I could have a set! Several weeks ago, my husband and I were returning from a trip to Atlanta and cut through Vinings so I could visit a nearby store before we went home. I haven't been to Vinings in a couple of years and was quite interested when we passed by this new teahouse there! While I didn't have time to have tea there when I was again in Atlanta last week, I did vow to at least stop by for a treat. 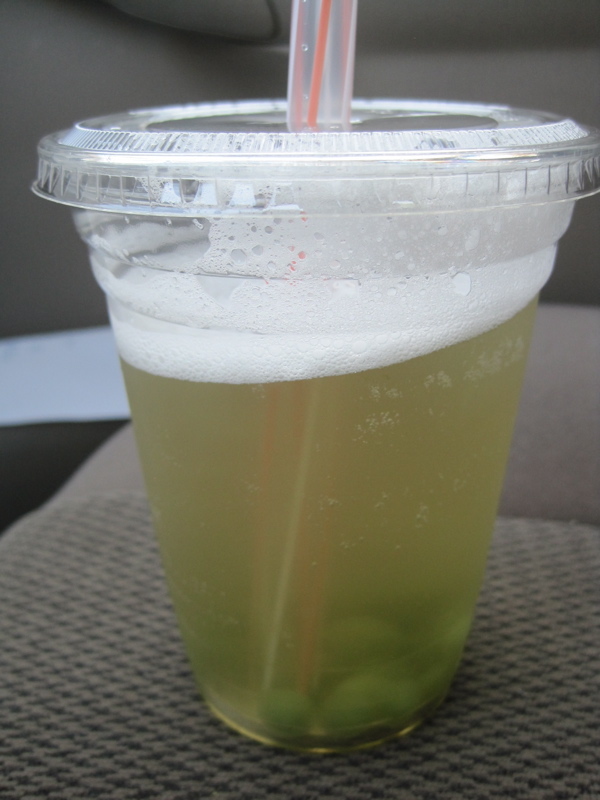 I managed to get there just about 10 minutes before their 7 p.m. closing time, but the gracious young man on duty told me that yes, he indeed had time to whip up some bubble tea. I was in the mood for something fruity and told him I'd take whatever he recommended, which ended up being a strawberry-flavored green tea with a very clean, refreshing taste. 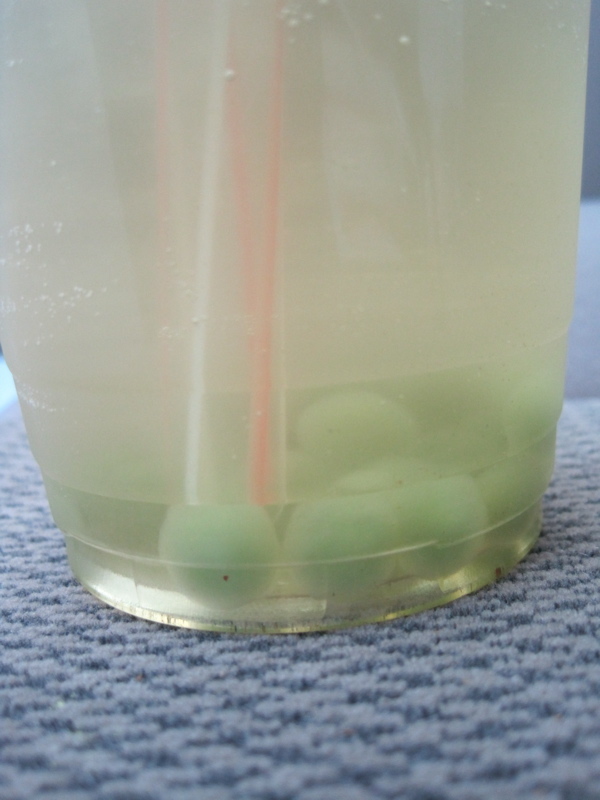 You also get to select your own bubble tea "pearls" at TeaFuse, so I chose the green tea pearls instead of the brown ones I've usually had before. 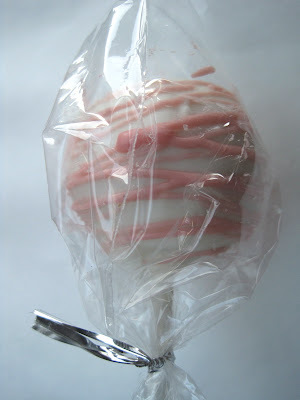 I decided to have a sweet treat as I drove home, and this cake-on-a-stick fit the bill perfectly, and deliciously! Cake pops, as they are called, are all the rage these days, and a friend gave me a book about them for Christmas so I really need to learn to make these myself. My first experience with TeaFuse was certainly a good one, and next time I'm in Atlanta I hope to return for afternoon tea. 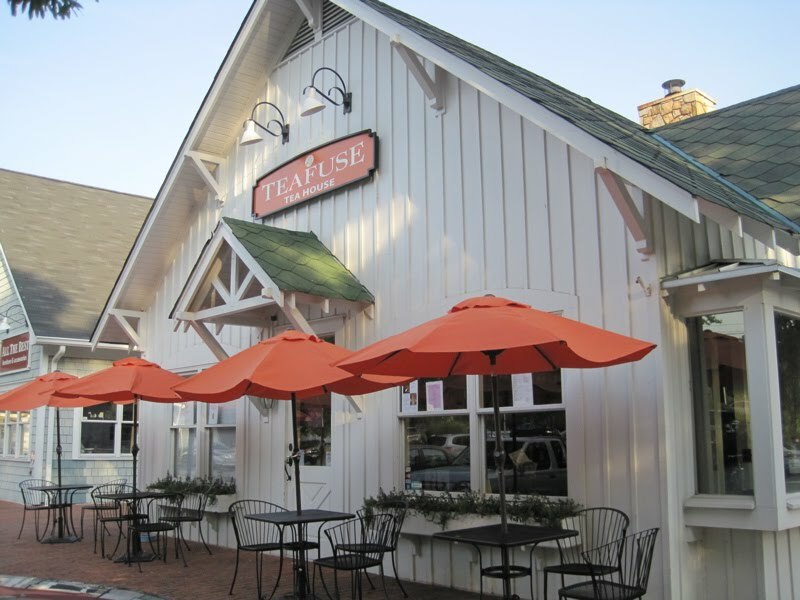 Go here if you'd like to learn more about the offerings at TeaFuse. 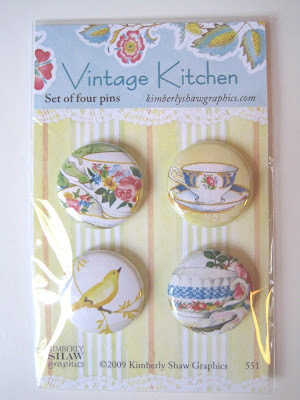 A new Kimberly Shaw giveaway! 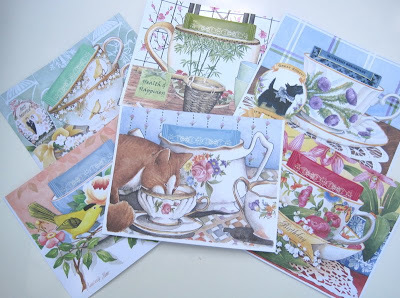 The Kimberly Shaw stationery giveaways have been some of the most popular ones I've ever hosted, so let's do another one thanks to the generosity of Kimberly Shaw! 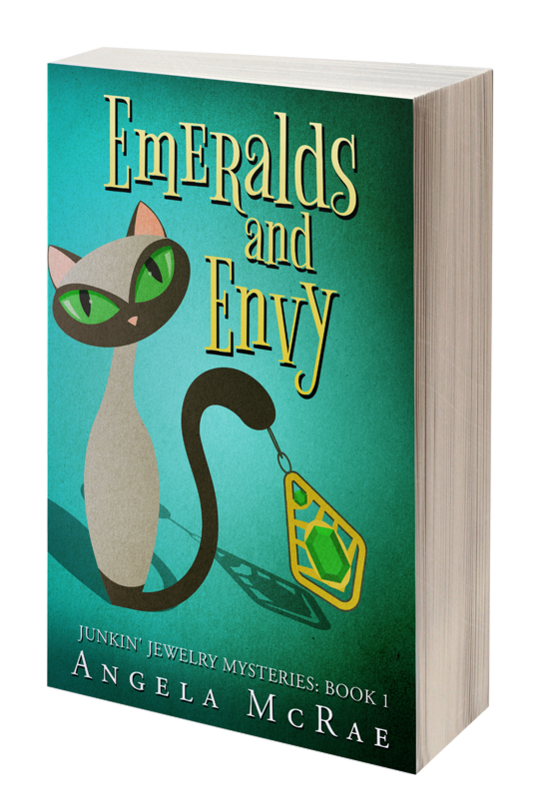 Again, since some of you do "catch up blog reading" on the weekends and often miss the giveaways, I am going to let this one run through Monday at 7 a.m. EST. 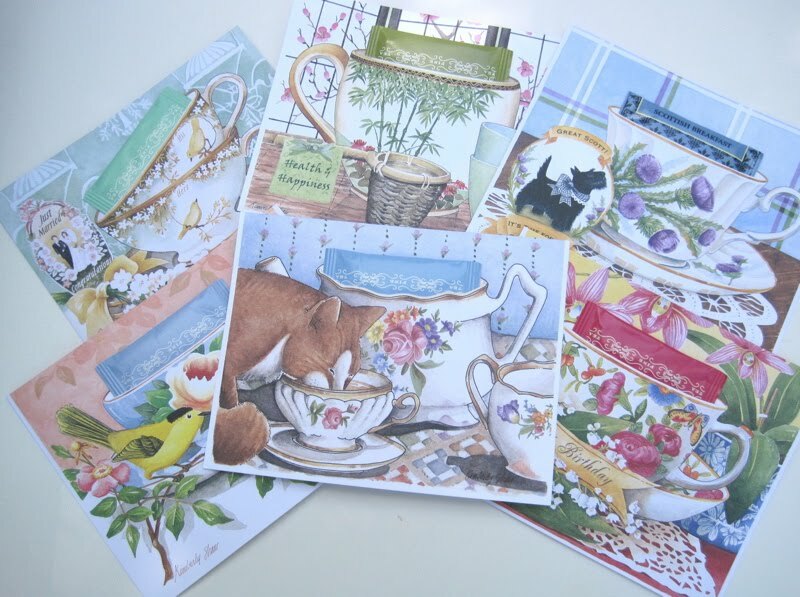 The winner will receive six of Kimberly Shaw's beautiful tea-themed cards, all with a teabag tucked into the design. 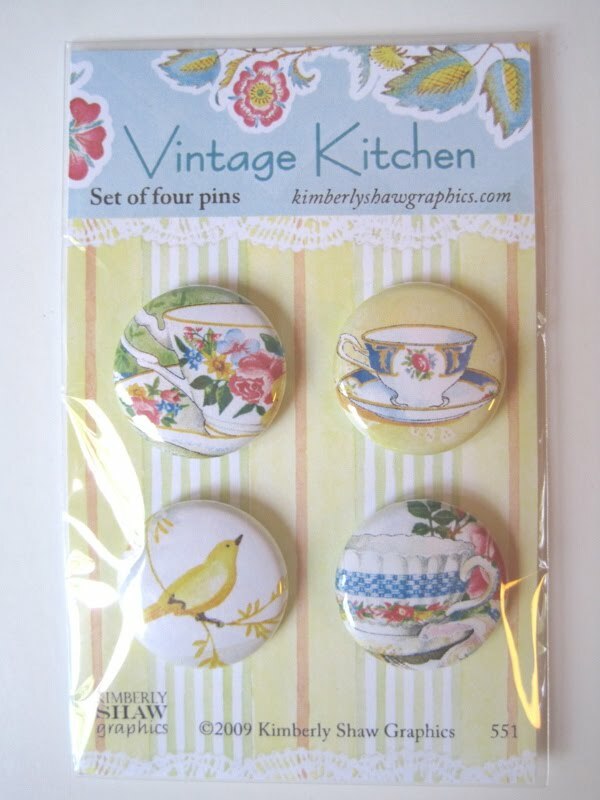 There are also four great little button pins featuring her designs. 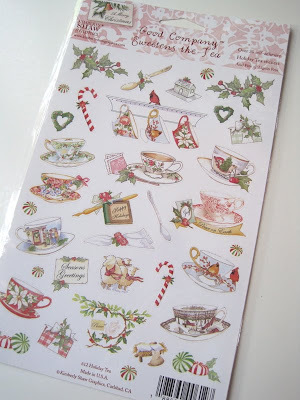 Wouldn't these be cute pinned on a tea package you're giving a friend? And there's also a lovely sheet of Christmas stickers to remind us all it's never too soon to begin getting ready for Christmas! Just let me know you'd like to be entered, and I'll announce the winner sometime Monday morning. Good luck!